Steamworks Brewing Co., in Durango, Colo. has a great atmosphere with a great beer selection. Locals and tourists belly up to the bar and sample a wide selection of brews on tap year around and throw peanuts on the floor. 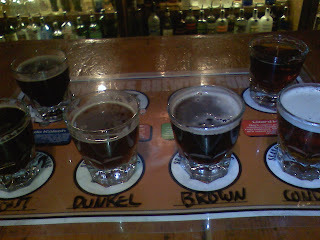 Since I am partial to dark beers, I had the bartender select a variety of stouts, browns and IPAs for me to try. I completely fell in love with the Cask Cayenne Stout, as a cask it is room temperature, with a rich cayenne pepper flavor in aroma and finish that will knock your socks off. I had to get a full pint of it later on. The Backside Oatmeal Stout has a great, classic oatmeal and malt flavor with hints of chocolate-I mean who doesn’t love a good stout? The Dunkelweiss was quite tasty. It is not typically brewed, but if you like a good Hefe, the Dunkelweiss is well, a smooth dark colored Hefe-not a bad choice, I really think it would do well if it was sold year around. Lizard Head Red has a great red beer with a balance of light hops, but I of course loved the Conductor Imperial IPA, with great floral aromas and that “gotta love” bitter taste with hints of sweetness at the end. The food was great too, I had a great Cajuon Boil dish with crab, shrimp, crawfish and sausage-paired perfectly with the Cayenne Stout.